Rift and Quartered are terms that refer to the visual characteristics of the grading face of each board. The "ray fleck," "flake," or "figure" of a quarter-sawn board is the medullary ray of the log, which emanates outward from the center of the log like spokes of a wheel. The degree to which this "ray fleck" is revealed is a function of the angle of the growth rings to the face of the boards. When the growth rings are 90 % to the face of the board the medullary ray is opened to the greatest extent possible. As the angle of the growth rings to the face of the board decreases, less medullary ray fleck or (Quarter Sawn) is revealed. Rift boards and Quartered boards share one characteristic. The growth rings manifest themselves on the face of the board as straight grain, with no visible cathedral grain or plain sawn look. More subtle appearance then plain sawn. Less prone to surface checking. The log is first cut in half, and then each half is cut into quarters. The quarters are then transferred from the head saw to the resaw where they are cut into boards. Each quarter is processed by cutting a single board off one face (A), turning the quarter cut end for end on a carousel, then cutting from the alternate face (1). The process is repeated, cutting faces B, 2 C, 3, D, 4, E and 5 until the quarter is completely cut. The quartered boards, those exhibiting the most "ray fleck", will be faces A, B, and C as well as faces 1, 2, and 3. These boards have growth rings at 60-90 degree angle to the face of the board. The rift boards are usually D, E, 3, and 4. 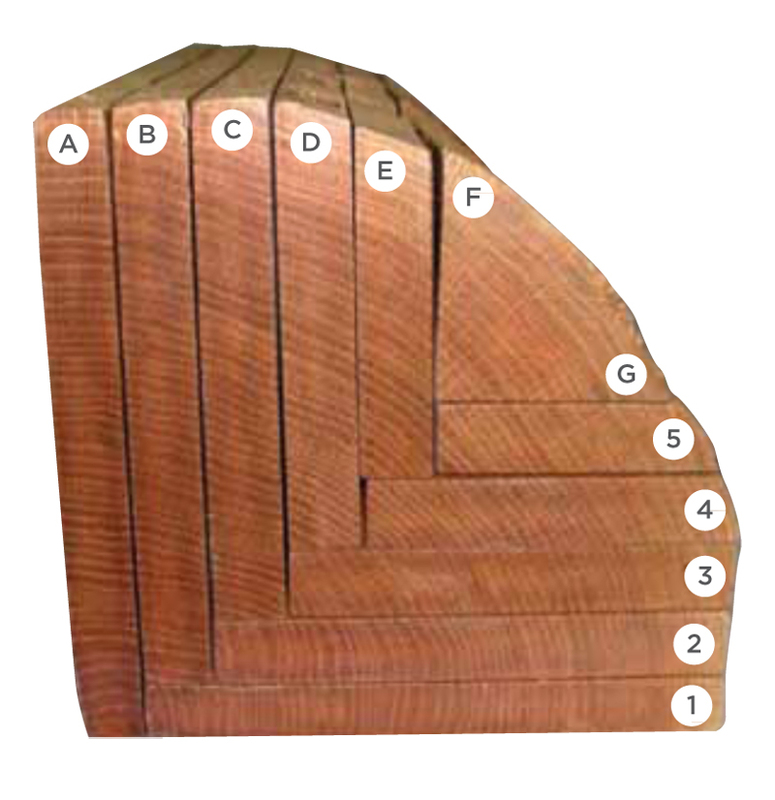 Boards C and 3 could be classified as either Rift or Quartered, depending on their appearance on the grading face. Rift boards, those exhibiting the least amount of "ray or flake" are most often those boards with the growth rings at a 30-60 degree angle to the face of the board. They are also the narrowest boards. Rift and Quartered is prized for its beauty and stability. 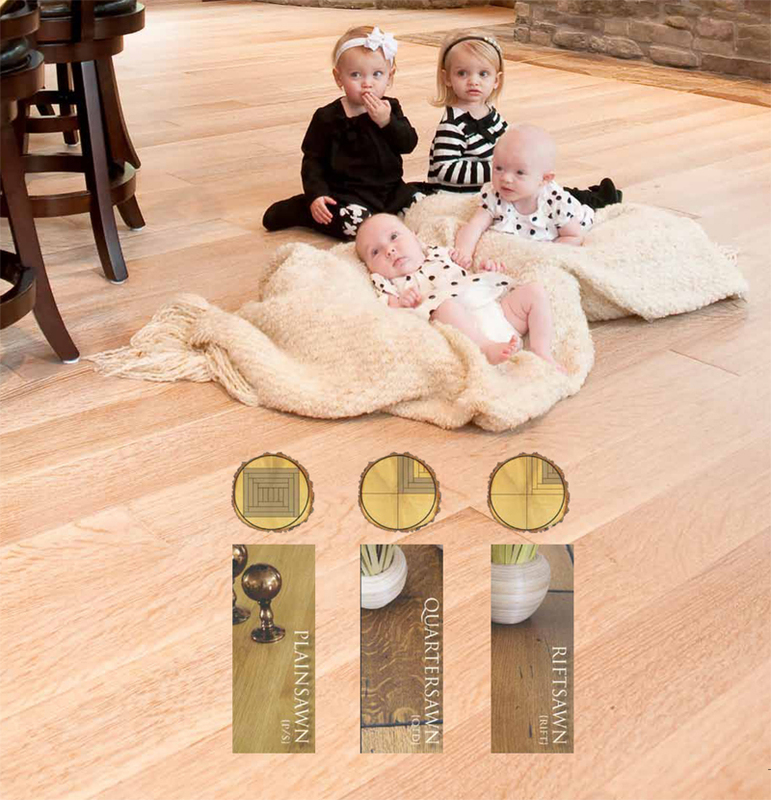 It also offers a higher level of consistency since it is made from high quality Northern Hardwood. Due to the way it is cut, it has a distinctive look.